It’s the biggest party in the world. There’s dancing, there’s music, everyone’s in crazy costumes and the party goes for five days straight – it’s Carnival, baby! 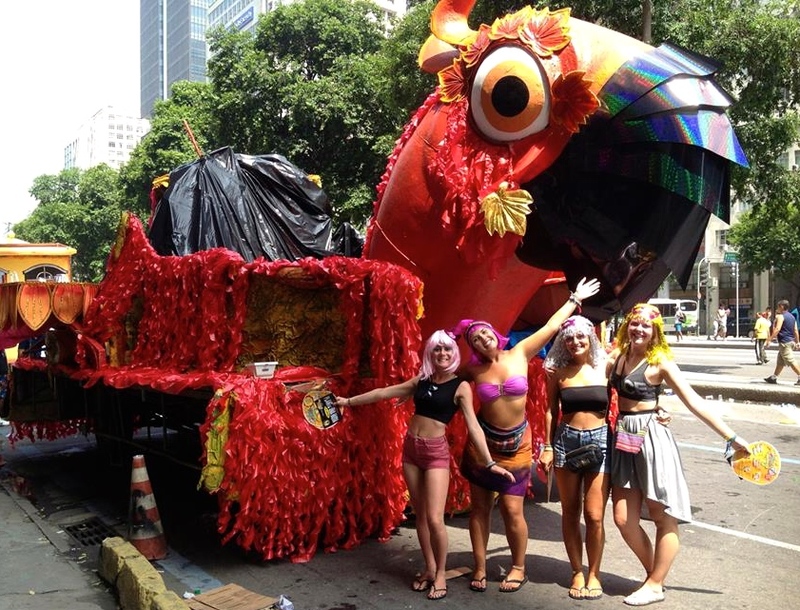 If you’ve never heard of Carnival you must have been living under a rock as half a million tourists flock to Rio De Janeiro, Brazil each year to celebrate the most famous festival in the world. If attending Carnival is on your bucket list keep reading, I give you the beginner’s guide to the biggest party of the year! WHAT IS CARNIVAL ALL ABOUT? Carnival is a wild, five-day celebration held each year, exactly forty days before Easter. It officially starts on Friday and ends on Shrove (Fat) Tuesday, with the beginning of Lent on Ash Wednesday. One is supposed to abstain from all bodily pleasures during Lent so Carnival, in all its excesses and profanity, could be interpreted as a farewell to bodily pleasures. Carnival is celebrated throughout every corner of Brazil but the biggest and most famous is undoubtedly found in Rio De Janeiro. Preparations for Carnival begin months before the event and it is the most anticipated week for Brazilians, young and old. Carnival is not something that you can attend on a whim, accommodation books out months in advance (and at extremely high prices). If you want to attend Carnival you will need to plan ahead and book accordingly. In my opinion hostels are the best option as you will meet loads of like-minded people to party with. 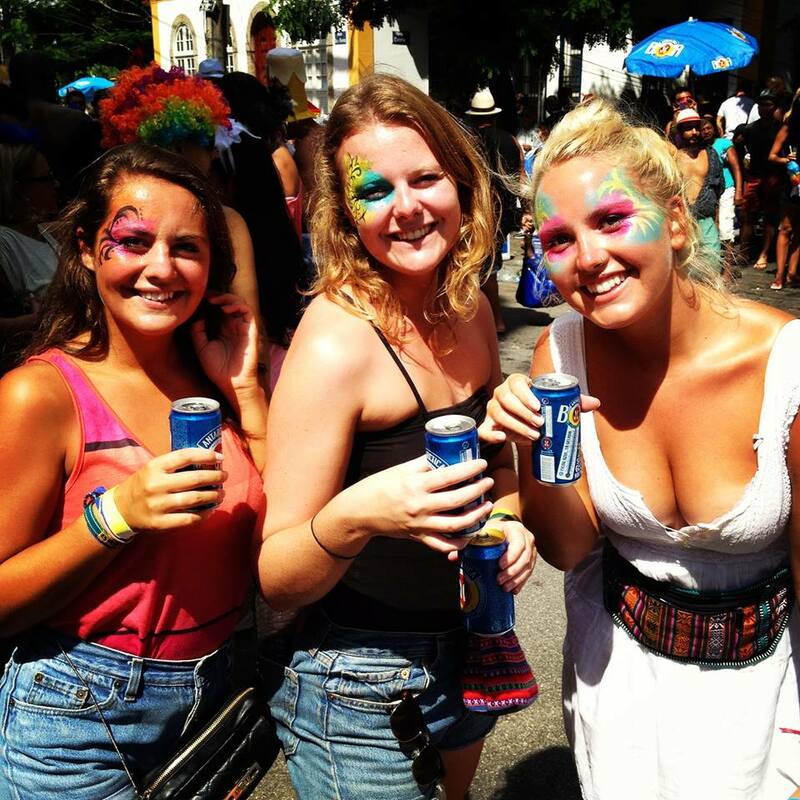 The staff at the hostels will know the area and have the local knowledge to advise on the best street parties (and possibly score you much cheaper tickets). We booked four months in advance and still had to pay $70 a night at a dirty, falling apart hostel that normally charged $2 a night. It was a disgusting place (Karl Pilkington from the TV Show An Idiot Abroad only lasted an hour at the same hostel, it was that bad) but we had such a fabulous week as everyone was eager to have fun. The hostel even hosted a party where they taught us to make Caipirinhas (Brazil’s national cocktail), provided free alcohol and free tattoos (seriously). You will want to ensure your accommodation of choice is in a central location, the closer to Copacabana and Ipanema Beach the better! The Street Bands & Parties run all day, everyday over the course of the five-day celebrations. They are spread out throughout the city and around 300 Street bands perform each year. 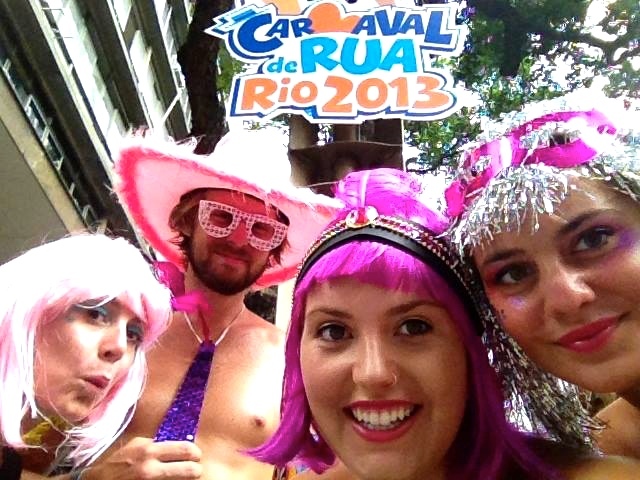 The best place to go see a street parade is on Avenida Rio Branco, in Centro, the city’s downtown area. 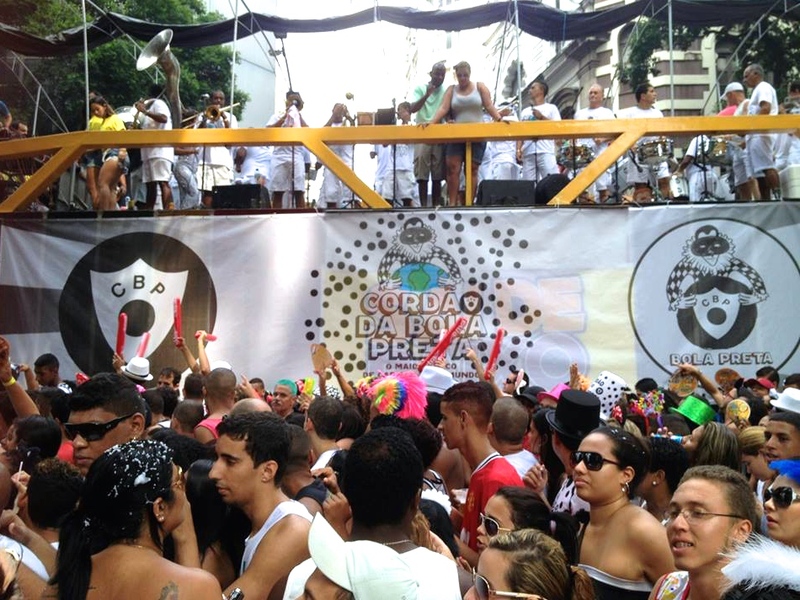 Another popular spot is Lapa, near the Arches of Lapa, where you’ll find thousands of revellers drinking, dancing and eating from the BBQ stands! Many street parties are unplanned and spring up on their own whilst others, like the street party on Cinåndia Square are held every night from 5pm. It is best to ask your hostel where they recommend going, they will know the up-to-date parties to attend! 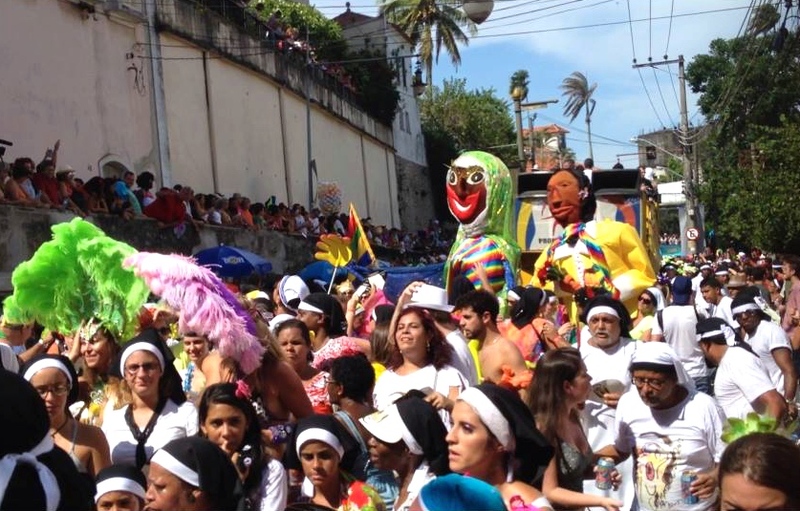 I particularly enjoyed watching the Carmelitas parade in the hills of Santa Teresa as many locals dressed as nuns, supposedly who created the Carmelita band originally. It’s also good to know that there will be street bands along Copacabana and Ipanema Beach each afternoon. We spotted a few celebrities watching the parade from their Hotel Balconies, including Will Smith, Kim Kardashian & Kanye West. Balls are another huge part of Carnival. Whilst some are extremely expensive, black-tie, include open bars and buffets and are attended by VIPs others are much more relaxed (and cheaper) like the Beer Ball & the Gay Gala. There are many to choose from. 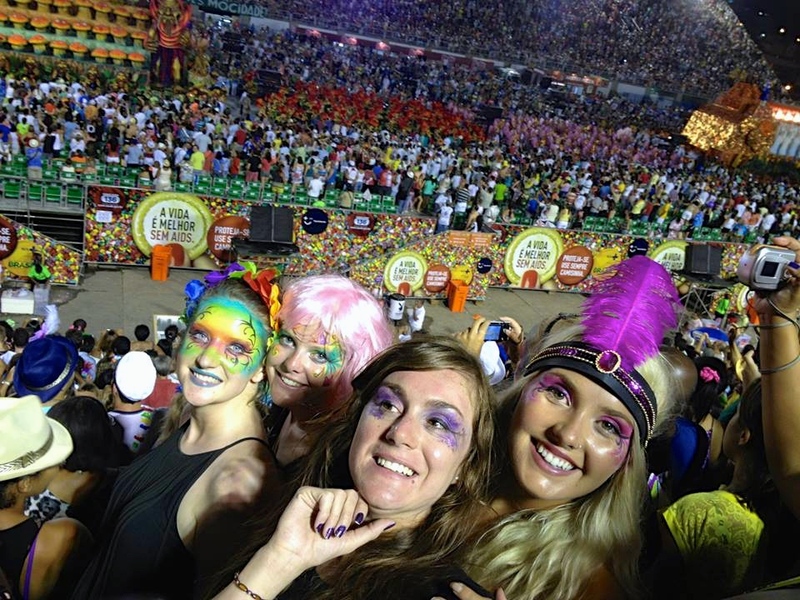 We attended the Mangueira Samba School Ball where we learnt to Samba and danced the night away. SO. MUCH. FUN! 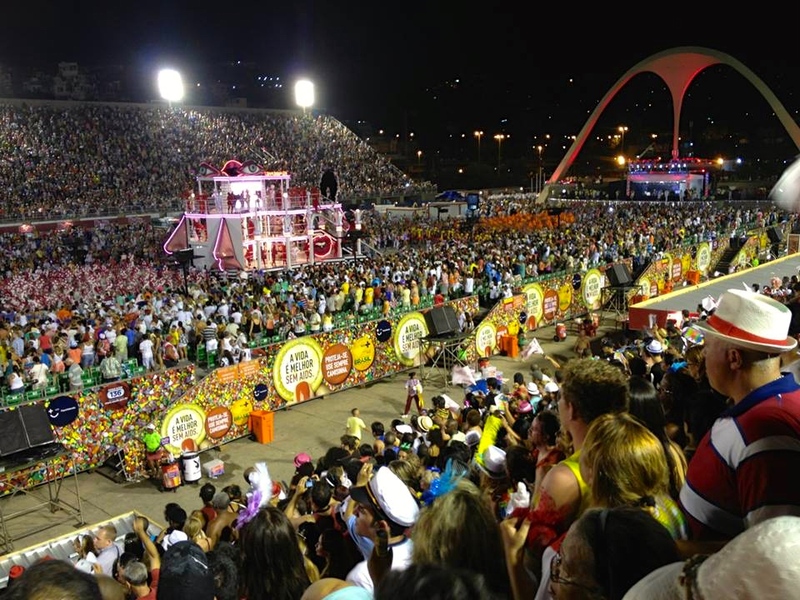 Rio’s Carnival has become world-famous through the Sambódromo, the biggest Samba competition in the world. Each year 14 of the best Samba Schools in Rio put on an extravagant parade, stretching along for 700 metres through the permanent parade route. The street is lined with concrete stands filled with 70,000 excited spectators. 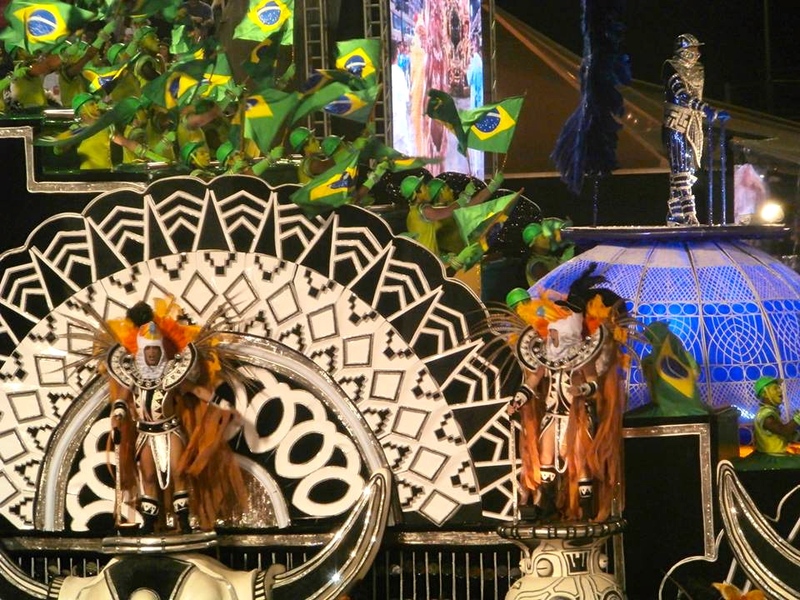 Each Samba school is escorted by 200-400 drummers and some of the most incredible costumes you’ve ever seen. The atmosphere is incredible! The best nights to attend are on Sunday & Monday with the next best on the Saturday. This is a ticketed event. You can purchase these online via the official Carnival website, though we got ours highly discounted through the hostel on the day (which could be risky, if none are available). One of the funnest aspects of Carnival is how everyone, locals and tourists alike, dress up in outrageous costumes. Sometimes parties have a specific theme (as does each years Carnival) though most people dress up in the brightest, craziest, most controversial and attention seeking costumes they can find. No need to bring anything from home, all of the stores will be selling wigs and paints for you to purchase. Be sure to dress up at least once as it really completes the Carnival experience. 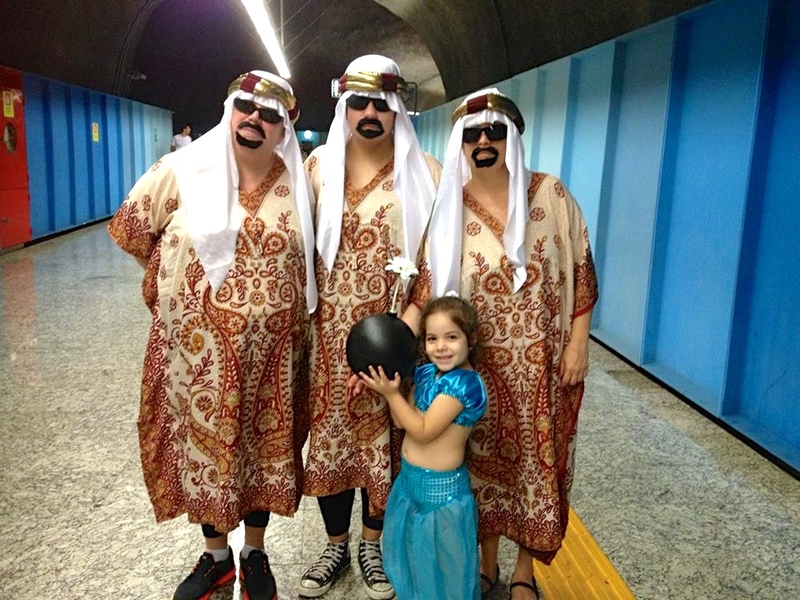 Note that this first photo was the most controversial costumes around (I didn’t approve). Carnival was truly one of the funnest experiences of my life, one that should go on every persons bucket list. I hope this guide inspires you to put it on yours too! Over to you! Have you been to Carnival? If so what other tips do you have to share? Or, if you haven’t attended Carnival does it sound like something you would be interested in? I am not a party person but every once in a while I do live to let my hair down with close friends. This looks like a place where I can go completely crazy. Bookmarked this. Will try to attend before I collect more grey hairs on my head. Haha. You should go! So much fun! All the pics look really fun! I love Rio. I’ve been there twice but never on carnival. I have to try it. 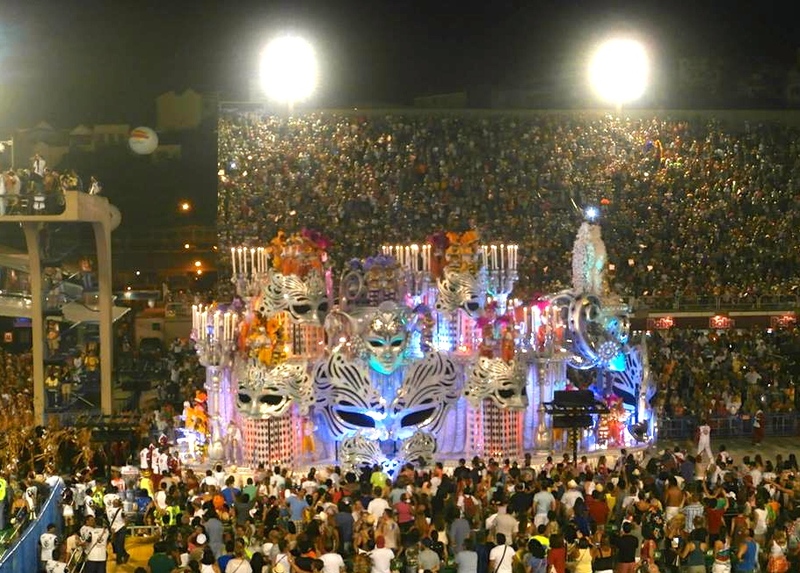 I plan to visit Brazil later this year and i am very interested in the biggest carnival in the world, but do not know if I can arrive there around Easter. It looks so much fun with all the different costumes, dance, parade and the energetic vibes. And you are right about informing us to book accommodations in advance. Jack up the price from $2 to $70 per night sounds ridiculous to me, but glad you all had a great time! Oh you will love Brazil, it is such a beautiful country. I spent two months there and it still wasn’t enough. I hope you have a wonderful time! OMG! This looks like so much fun with all the costumes and accessories. I have only seen such massive gatherings shown in movies, Never knew such things do happen really. No wonder that all the hotels and hostels in the vicinity get overbooked so well in advance . You had never heard of Carnival? It truly is the biggest party in the world, SO much fun! Yes, perhaps Mardi Gras was inspired by Carnival, I see the resemblance too! Oooooh !!!!! Thank you soooooo much for this article !!!! I was really looking forward to it, but now … Even moooore excited !!!!!! Tatataaaa tatattaaaaaa (Im singing the typical “song” ) ???????????????????? + its gonna be my birthday ! But first : biggest exam of my life 🙁 . Thanks again for this !! Ooh I SO want to go now! On the list – looks like great fun!